Usain Bolt added the 200m Gold Medal to his 100m win in Beijing today overcoming a powerful challenge from Justin Gatlin in the process. He powered over the line in a time of 19.55 seconds at the Bird's Nest in Beijing, the place where he burst on the scene so memorably in the 2008 Olympic Games. This is the Jamaican's 10th World Championship Gold medal and the aftermath will also be long remembered as a cameraman on a Segway clumsily knocked the sprinter over during the celebrations. As Bolt made his way around the track, runners in his hand, the cameraman in question took his eye off of his driving for a split second and crashed into the unsuspecting champion. Bolt quickly tumbled backwards away from the cameraman and got back to his feet before continuing his celebrations in a somewhat gingerly fashion. The cameraman, ever the professional, made sure to check on the health of his equipment after the incident before holding his hand up in apology to Bolt. The Jamaican was thrilled at his performance but there was no doubt in his mind that he would be victorious telling reporters "There was no doubt. I told you guys that I would do it." He added "I'm happy to be a 10-time World Championships gold medallist, especially when people have been saying I would lose." 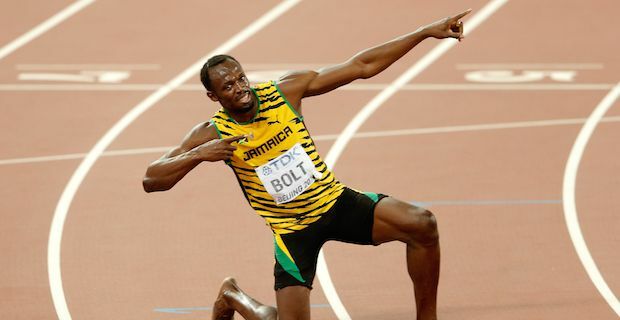 Winning the World sprint double over Gatlin has surprised many after Bolt struggled with injury for much of this year. Gatlin meanwhile seemed to brush everybody else aside with ease and was considered favourite to beat Bolt coming into the Championships but crossed the line in a disappointing time of 19.74. However, after today's result, Bolt has not lost a 200m sprint event since winning the 200m Gold in the same stadium in 2008 in what has been a phenomenal career.